It is nothing new that fashion goes in cycles, and what was once considered ghastly can now be found fabulous. Hip huggers, bell bottoms, pedal pushers, even crop tops (dear God) have come and gone, only to return reworked, and embraced by fashionistas (or those who claim to be-looking at you Glamour Don'ts!) worldwide. A romper suit is a one-piece garment worn by children and sometimes women. Somewhat similar to a coverall, it is loose fitting and usually has shorter legs that may be gathered at the end. Puffed pants are particularly associated with rompers. Rompers usually are meant as a combination of shorts and a shirt, though the term can include jumpers, one-piece bathing suits, and clubwear fashions to name a few. I haven't seen many women wearing these on the actual streets of Orange County, unless you count OC Housewife Vicki, who donned a romper on the show, but even then it was in her backyard, and sorry Vicki, I think these have an age limit. I am not sure whether to embrace and run away from the one-pieced marvel. As Wikipedia wisely noted, it can be construed as 'clubwear.' To me, that means it would be found at Fashion Bug in the skanky section, made of a polyester blend, and accessorized with plastic shoes that may sparkle. No dice. 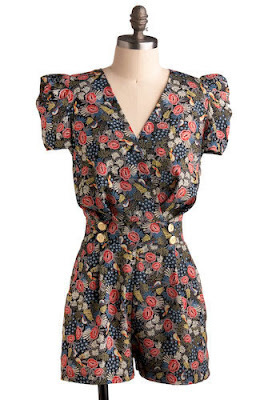 However, companies that embrace cotton and other natural fabrics have been putting out a retro, vintage look of the famed romper and I must admit I might try one on. How cute would this be with espadrilles and red lipstick? We'll see if I actually go for it. This is the first one I have seen with a suitable print and acceptable fabric. Damn puff sleeves get me every time; I am a sucker for those. i could totally see you in this. however, can we agree that the strapless, terry cloth numbers are a definite no? or am i missing something? LOL, I have to agree that terrycloth is never a good decision, and definitely not strapless!